Just the ticket to keep cool during this hot summer. 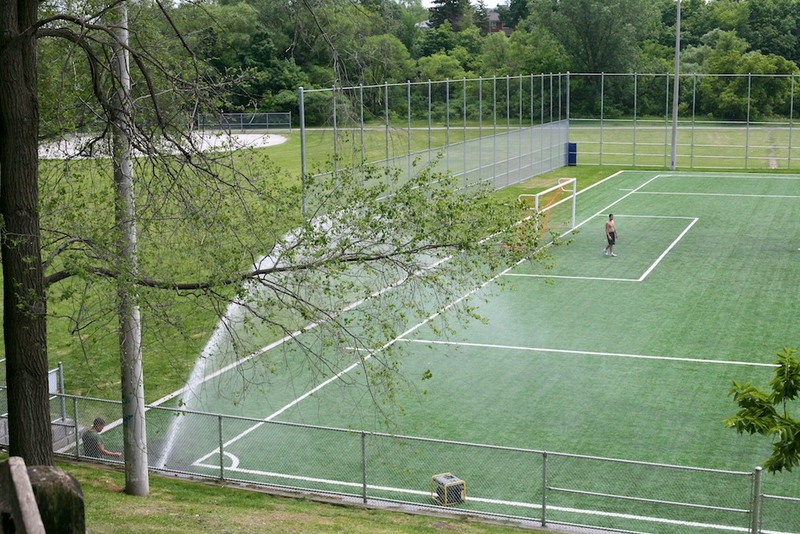 Passers-by were doing double takes the other day as a worker was seen watering the new artificial turf soccer field in Lions Park. The worker said that this is done every so often to keep the playing surface clean, much like scraping and flooding an ice rink. One thing is certain, the new field has been a big hit with players. Artificial turf? Who’s idea was that..Everybody’s going back to grass..baseball, soccer etc..Is this just a cost cutting idea city has no one to cut the grass!? Real grass is better! This was a Federal Infrastructure project (not that our MPP and councillor have been shy about claiming credit). The artificial turf allows many more players to use the field without the need for maintenance, such as re-sodding and grass cutting. The old field was poorly drained, muddy and quite devoid of grass in large areas because of the high usage.